6-Pin DIP 400V Zero Crossing Triac Driver Output Optocoupler. 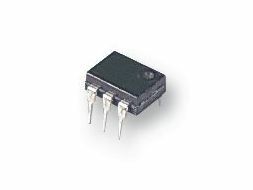 The MOC3040 devices consist of a AlGaAs infrared emitting diode optically coupled to a monolithic silicon detector performing the function of a zero voltage crossing bilateral triac driver. They are designed for use with a triac in the interface of logic systems to equipment powered from 115 VAC lines such as teletypewriters, CTRs, solid-state relays, industrial controls, printers, motors, solenoids and consumer appliances, etc.